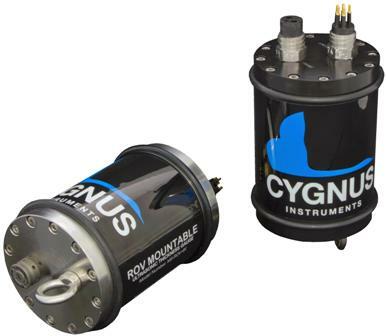 Specifically designed for underwater remotely operated vehicles, Cygnus offer two dedicated ROV Mountable thickness gauges, the M5-ROV-2K – 2,000 m depth rated, and the M5-ROV-4K – 4,000 m depth rated. These mountable measurement gauges again benefit from the multiple-echo technology found in all our ultrasonic measuring devices. They are truly versatile and designed to measure metal thickness through coatings in the harshest operating conditions. Dedicated software reveals the date, time and thickness readings on the surface which may be logged or stored. In addition, a Topside Repeater (TSR) is available providing the ability to present the thickness measurements remotely and overlay them on to a video signal. This permits the measurements to be superimposed on the ROV camera’s monitor screen. Available in two models: M5-ROV-2K 2,000 m depth rated and M5-ROV-4K 4,000 m depth rated. Selectable Deep Coat mode for measuring through coatings up to 20 mm thick. 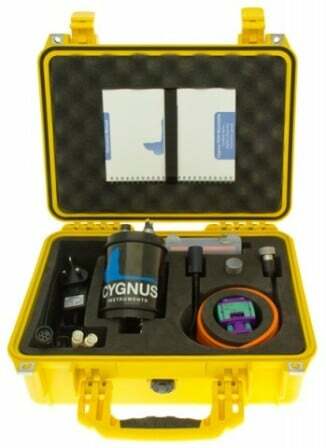 Supplied with CygLink software to display and log thickness measurements from the ROV on a computer at the surface which can be saved to a file and printed out. CygLink has two data logging facilities: Quick Log for simple recording of thickness measurements and Structured mode with four templates available – Single Point, Multi Point, Grid Point and Key Point. 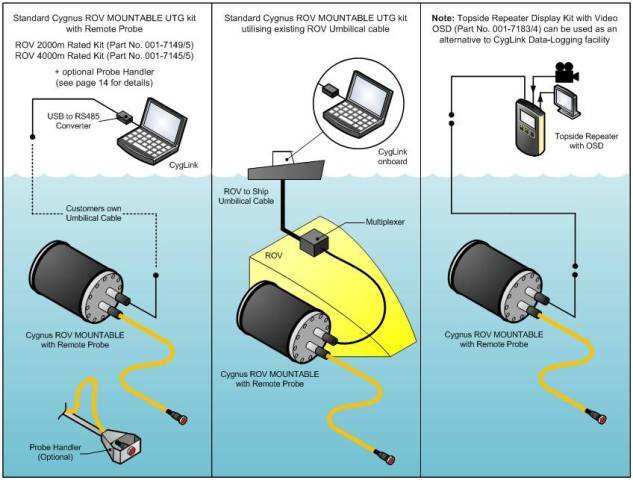 The ROV Gauge sends thickness measurement data to the surface via an RS-422 serial link, Cygnus can supply the RS-422 umbilical cable up to 1,200 m in length. For longer distances the ROV Gauge can output data in RS-232 mode. Fitted with a safety Pressure Relief Valve and Securing Eye. Easy calibration at the surface via CygLink software or Topside Repeater (TSR) unit. Removable end plate for full serviceability with access to the Option Switches, Fuse and Status LED. Wet mateable ‘MC’ style underwater connectors. Contact us to find out more about the Cygnus ROV Mountable – Multiple Echo any of our other thickness gauges, or request a quote online. The Cygnus Topside Repeater (TSR) is available as an option and has the facility to display the thickness measurements remotely and overlay them on to a video signal. This allows the measurements to be superimposed on the ROV camera’s monitor screen. The Cygnus G1 Probe Handler is designed for use on Observation, Inspection and Light-work class ROVs. Constructed from acetal it is both strong and lightweight it features an adjustable mounting bracket allowing optimum positioning of the UT probe. The UT probe is located in an articulated mount that allows up to 15 degrees of movement in both planes allowing automatic alignment of the probe face to the measurement surface making the ROV pilot’s job easier. Complementing the Cygnus range of ROV Mountable thickness gauges, the NEW Cygnus S1 Probe Handler is developed for use on Inspection and Medium sized ROVs carrying out ship hull inspections. Complementing the Cygnus ROV Mountable thickness gauges, the Cygnus W1 Work Class ROV Probe Handler has been developed to offer an engineered probe-handling solution for Work Class ROV thickness gauging operations.